On January 21, 2017, hundreds of thousands rallied at the Women’s March on Washington for diverse issues including women’s rights, racial equality, and the environment. Counting more than 500 sister marches across the United States, it was the largest single-day protest in the nation’s history. 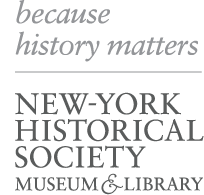 As part of its History Responds program, the New-York Historical Society collected a range of artifacts, including signs, sashes, pussyhats, and colorful props, to document the moment. One year later, Collecting the Women’s Marches highlights some of the political and visual themes that emerged, as well as the efforts of individuals and groups that worked behind the scenes. An adjunct display of protest clothing by Olek (Agata Oleksiak), an artist who works in crochet, and Brick x Brick, a public art performance group, will be on view. Curated by Rebecca Klassen, assistant curator of material culture.